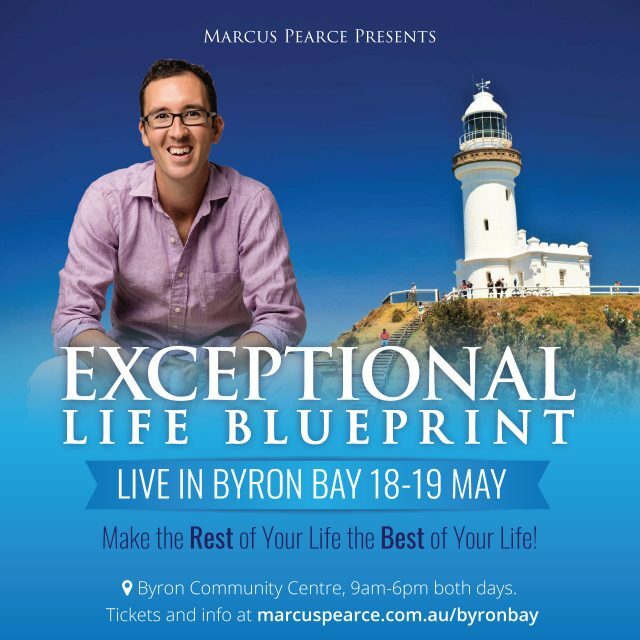 Spending 12 days on an island that has no public transport, no crime, two police stations (both unmanned – for obvious reasons), one nursing home (with 10 people in it) and not one multi-national business (seriously) presence will do a lot to your philosophies about life. Here are just seven of my take-home and apply steps from my time on the beautiful Greek Island of Ikaria. I haven’t cooked on high since I returned home and cooking with coconut oil or any other oil other than olive oil is out the window. It’s olive oil on low to medium heat at all times now. 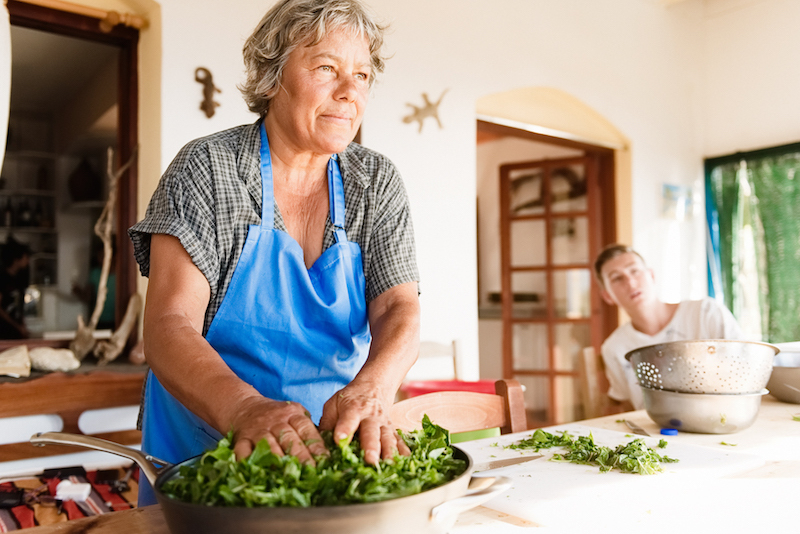 Yes, it may mean cooking takes longer, but so what? Why have we become obsessed with meal prep to be complete in a flash? Because we’re so busy being busy – on what exactly? Rushing around like a headless chook with our priorities somewhat skewed to the urgent and not all that important if you ask me. 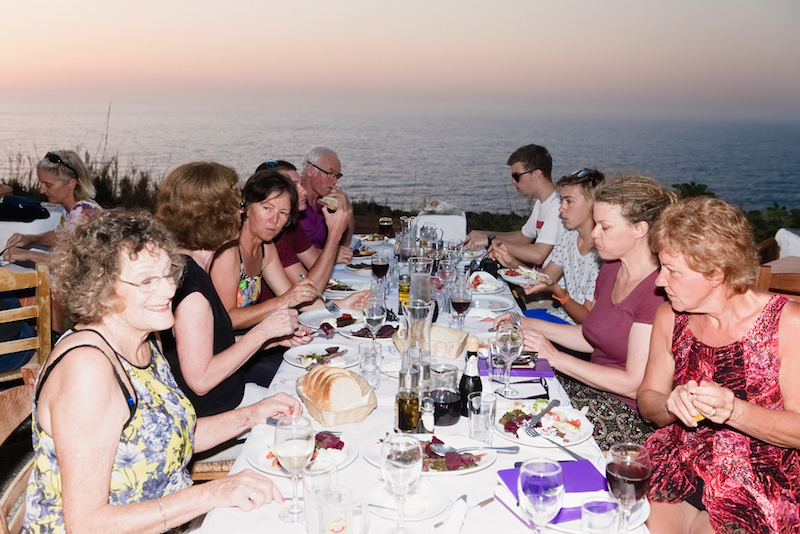 In Ikaria, eating food is a ceremony, and so is preparing to eat. Watching Athena and her sister Poppy, the “head chefs” at Thea’s Restaurant, ply their trade was awe-inspiring. Watching a master at work is a true privilege. If you have a European background this is probably familiar to you. I have no doubt you have eaten this way before. In short, rather than each meal being “plated up” on to your plate before you eat, the entire meal is served on various platters and plates on the dining table and everyone simply eats what they want. You might ask – “but what if my child only takes potatoes?” – and you have a point. You always have the right though to question their decision making. At the same time, the autonomy family style dining provides young children is fabulous. I have loved seeing Maya & Darby revel in choosing what THEY want, rather than what WE want them to eat. They select different cuts of meat, varied amounts of vegetables (often more than we would choose), and overall I notice that we are conversing more at the table and simply celebrating our food more. The kids are improving their table manners with every meal (“may you please pass the salad Dad”) and meal time is taking longer which means quality family time is lasting longer. I have often resisted the desire to rest during the day. My “productivity” hat has labelled a daily nap as unproductive in the past. However if you already have cultivated this habit I have no doubt that you would argue quite the opposite. And you’d be right I believe. Some of the “busiest” and most productive people we know of (Winston Churchill, Albert Einstein, Thomas Edison, JFK and many more) had a habit of napping. So since I’ve returned home, Sarah and I have worked as a team to allow an afternoon nap. It doesn’t always work (particularly for Sarah), however when it does, it always allows for a more productive afternoon. I know what you’re thinking! Let me just tell you what I’ve done and how it’s impacted my thinking. I’ve removed the time from my Macbook. Right now I have no idea what the time is. If I want to know I must pick up my phone. I haven’t worn a watch in yonks so that adjustment hasn’t been necessary. What I have noticed though is that many of my decisions about what to do at any particular time have been based on what time it is. “It’s too late to stay up and work” or “it’s too early to get up and do X” or “I won’t do XYZ because I don’t have time”. In Ikaria, this doesn’t come into the equation. They are very “anti-time” or “pro present moment”. They aren’t thinking about the past or the present; instead they are sensational at making the most of NOW. For example, one day I was with Thea running errands in a nearby village and we were “running late” to get back to the restaurant for an Ikarian cooking class. The rest of the group were due in the kitchen at 11:30am and Thea wanted to be there to run it. This wasn’t going to happen based on how long our errands were taking. Instead of being flustered and consumed with what the time was, Thea continued to chat with shopkeepers (who were also friends), the gas man as he filled up her car with petrol, a friend of her son’s whom she passed on the way home, and so on. You would have thought she had the day off and had no agenda at all! Yes, my “Melbourne mind” was going a little crazy at observing this extreme case of present time consciousness, however this incredible woman was being respectful and kind with everyone she met without any sign of an undertone of stress about what was happening back at her restaurant. As it turned out, head-chef Poppy was leading the class with aplomb, taking the group through a double-cooked chickpea dish, a traditional grilled-vegetable recipe and home-made tzatziki! By the time we arrived back, no one even cared that Thea and I had been missing! What life lessons have you learnt whilst travelling away from home? I’d love for you to share them in the comments below! 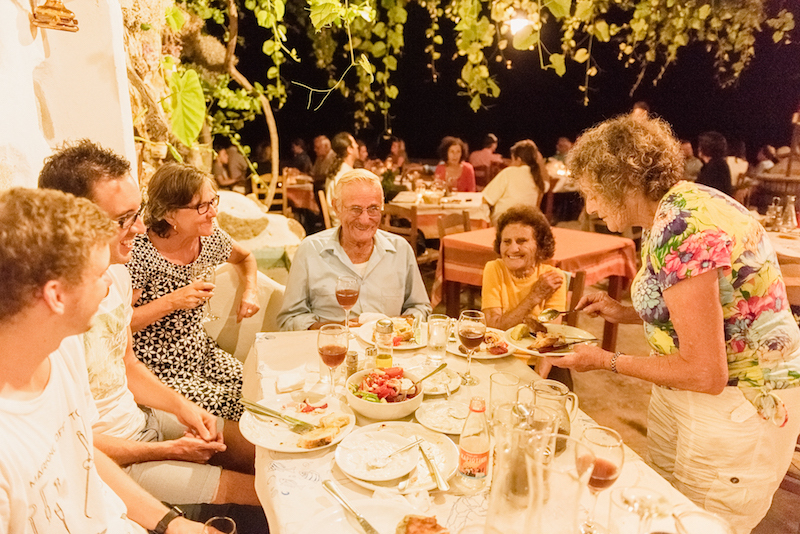 I truly hope you’ve enjoyed Part 1 of this special report on my time in Ikaria for the 100 Not Out Longevity Experience. To find out more about our 9-night 10-day 2018 Experience to the “island where people forget to die” click here or watch the video below.